I just got an order of supplements in and I am pumped! I got stuck in choosing pretty much the same supplements for a few months there, and hadn’t really tried anything new for a while. This time I decided to do some research and find some top quality supplements that I haven’t tested out yet. I found a few highly rated supplements that I thought I would give a try, and I have now a complete summer stack of supplements to run for the next month or so. Included in the stack from top left to bottom right is Xtend (intra workout drink), Anavite multi vitamins, Amino Energy pre workout, Animal’s Omega fish oils, ISO 100 Whey Protein, Genr8’s Vitargo S2 (post workout carbohydrates), and Monster Milk (my post workout drink to be taken 30 minutes after Vitargo S2. The bottom three supplements are completely new to me, while the top four supplements are either supplements I’m taking right now or have in the past. If you’ve followed my blog you will know that I’ve taken Anavite before, Omega in the past, and am currently in love with Amino Energy for a pre workout. I’ve recently just started taking Xtend during my workouts as well. These new supplements will give me some new products to write a review for in case any of you out there are interested in trying any of the above. I will be the first to tell you that this is a very expensive supplement stack because they are top notch products. 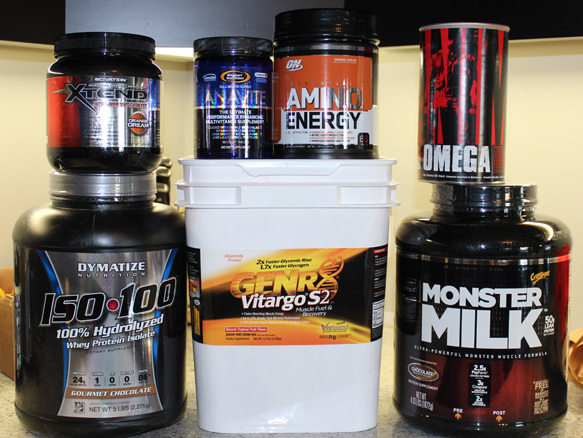 The ISO 100, Vitargo S2, and Monster Milk have been recommended to those willing to spend a little more on high quality supplements and I am more than willing if they live up to the expectations. Although summer time is very hard to stick to proper eating, supplementation, and limiting the alcohol, I am going to give it my best shot during the next few months. I may be heading out to Las Vegas early August with a few friends, so that will give me some motivation to get in excellent shape. Not included in the picture for supplements that I will be taking include Greens+, Carnitine, BCAA powder, and a Milk Thistle to help my liver with all of these pills. I am definitely going full out here with my summer supplement stack, but I’m interested to see if I will notice a difference in the gym and in the mirror. I will of course keep you posted with some blog posts!